Some may say, as I first thought that this can actually be done in 16 hours not 20-24, but this is false for reasons I shall explain shortly. Now as you could expect, this farm is a little more involved, it is not just restricted to your base, it is limited by your base complexity, but will also require outside harvesting, though with the system I have come up with, is infinitely consistent and fully doable within the time constraints presented by the farm itself. I am of course talking about, the Stasis Device. Stasis Devices sell for a cool 18 million at the base value or 19.8 million at the Galactic Average, but they require a whole lot of resources to make, so let's break down the blueprints. I have applied levels of crafting to blueprints, so a level 1 blueprint is something that only requires base resources to craft, a level 3 requires at least one level 2 and a level 5 requires at least 1 level 4, without counting the Atlas Seed Blueprints, level 5 is the max, Stasis Device & Fusion Ignitor are both level 5. Stasis Device requires a Quantum Processor, Cryogenic Chamber and Iredesite. Quantum Processor requires a Circuit Board and a Superconductor. Cryogenic Chamber requires Living Glass and a Cryo-Pump. Iredesite requires Aronium, Magno-Gold and Grantine. Circuit Board requires Heat Capacitor and Poly Fibre. Superconductor needs Enriched Carbon and Semiconductor. Living Glass requires Lubricant and Glass. Cryo-Pump requires Hot Ice and Thermic Condensate. Aronium needs 125 Iridium and 125 Carbon. Magno-Gold needs 125 Gold and 125 Iron. Grantine needs 125 Emeril and 125 Heridium. Heat Capacitors require 200 Solanium and 100 frost crystal. Poly Fibre requires 100 Cactus Flesh and 200 Star Bulb. Enriched Carbon needs 250 Radon and 25 Carbon. Semiconductor needs Thermic Condensate and Ammonium Salt. Lubricant requires 400 Gamma Root and 50 Coprite. Glass is just 250 Frost Crystal. Hot ice needs Ammonium Salt and Enriched Carbon. Thermic Condensate needs 250 Sulphurine and 25 Carbon. Ammonium Salt needs 250 Nitrogen and 25 Carbon. Now, this certainly seems a lot to take in, but my system is quite simple when you break it down and I'm giving you every last bit of information as I always think it's best to try and understand the entire process. For simplicity, here are the blueprints you will need and where to get them. All of those are gained throughout the base quests, the last to be obtained out of that list is Living Glass, almost at the end of all of the missions. These are all gained from visiting Manufacturing Facilities and completing the puzzles. Despite a pattern I had seen emerging in my own experience, it doesn't matter which race inhabits the system you are farming for the Blueprints, but it is worth noting that Vykeen has a lower chance of giving you a puzzle that can reward a Blueprint, and that both Gek and Korvax have a point where you will not get a puzzle that grants a Blueprint for up to 7 times in a row, so it can seem as though they are not giving them. Here is a spreadsheet made by Ket, which shows each puzzle, and what each answer will reward as well as the order that each puzzle will present itself for all races. It's incredibly helpful and just another example of Ket's Wiki like nature. Now let's look at the base farm construction. Now, this part of the construction line is what dictates the limitations as we are limited to 2000 complexity. It is where we will grow the crops that make up the Glass, Lubricant, Poly Fibre and Heat Capacitors which are then made into the Living Glass and Circuit Boards. This farm runs on a 15-minute harvest with a 120 minute (2-hour) cycle. You may think that harvesting every 15 minutes for a total of 8 harvests per cycle is a bit much, but this is a full-on operation, you won't have much downtime and the rest of the gathering is split up into 15-minute increments while the crops are regrowing. Using these most efficient of methods we can stuff enough crops for 26.5 Circuit Boards and Living Glass per cycle, leading to 26.5 Stasis Device per cycle in the grand scheme. The only non-essential component of this farm is the Galactic Trade Terminal but at only 10 complexity, you can't do any more than add 2 more Solar Vine, which on its own is a bit pointless. It requires a Hot planet to build due to the Solar Vine being by far the most abundant crop. If you want Holodoors instead of Normal Doors you will need a further 300 Carbon, 3000 Radon and 3000 Sulphurine. Where you will find a calculator which allows you to pick up to 14 different craftable items and how many of each you want, it will then give you a breakdown of the base resources required to build them as well as the total for all selected blueprints. For building it, ensure you put one of the domes on top of the default circular building and use the ladder to access it. Put the Galactic Trade Terminal inside the default building then place the other 12 bio-domes freestanding within the circular base building restriction with a door each for access. Plant your Solar Vine outside and everything else in the domes, and be sure to consider when planting which crops you'll be farming the most as far as placement goes, Frostwort will be harvested every 15 minutes, Gamma Weed, Coprite and Star Bulb every 30 with Echinocactus and Solar Vine only once per cycle. Now the farm is sorted let's move on to the gases. An over view of the Stasis Device farm showing the 13 Domes and their placements as well as the OCD straight line of Solar Vine. Gases can be obtained in multiple ways. You can buy them from traders at trading posts or the Galactic Trade Terminals in your base, at a Trading Post or randomly on the planet but not from Space Stations. You can also harvest them as a secondary resource from specific flora or the most consistent method, farm it via Atmosphere Harvesters. For this system we will be purely Farming via Atmosphere Harvesters, I had originally planned to gain some from flora when collecting the Carbon needed, but this method proved unsuccessful and overly complicated opting for a planet with a far more dense forest for the carbon harvesting. The gases required to build 26.5 Stasis Devices are substantial, you need 13,250 of all 3 gases. Each Atmosphere Harvester will produce a maximum of 250 of the respective gas, this takes 1 hour to gather. You will need to build 81 Atmosphere Harvesters, these will be harvested twice throughout the farming schedule, you could do it once, but that would be almost double the require harvesters and it is kinda insane how many you already need. Despite what the Wiki suggests, they will not fill up at different speeds relating to where they are placed, so just place them right by the portal for a speedy harvest and recharge. Also, in case you are curious about why it is sets of 3, Atmosphere Harvesters are limited, to 3 per planet. For Sulphurine, you need 27 placed in sets of 3 over these 8 addresses (the 9th being your Home address if using your own stasis device farm and therefore on a hot planet, or if you are using mine or someone else, use that address for the 9th set of 3 harvesters), If you are not in Euclid, you are looking for Hot or Barren worlds, remember that Barren and Dead are very different, if it has Cactus Flesh in the scan, it is Barren. Then for Nitrogen, you need a further 27 spread in sets of 3 over these 9 addresses, and if you are not in Euclid, you are looking for Lush or Toxic planets. These Harvesters do require charging, and the charge will last one hour so they need to be charged every time you harvest. Using Plutonium only requires 50 to fully charge, this makes things nice and easy, and this fuel can be gathered in seconds while also gathering the Heridium which we will cover in the final gathering section. This huge amount of Atmosphere Harvesters as you can imagine will be incredibly expensive to build in the first place and to build them you will need the following items. You can gather the Heat Capacitors easily if you are on PC and in Euclid as with the Acid also by visiting the farms I built specifically for this purpose, they are listed just below and specifically make Acid and Heat Capacitors, it won't take you long to get them all that way as you can harvest enough for 28 each time. PLEASE BE SURE TO NEVER CLAIM A BASE ON A PLANET OR IN THE SAME SYSTEM AS ANOTHER PLAYERS BASE! If you are not on PC or in Euclid, it still isn't too difficult as the Farmers Market (linked below), hosts a vast database of player farms and bases over both platforms and multiple galaxies and game modes, I'm still looking for more farms to add to it all the time so please add yours if you haven't already to help out your fellow travellers. The Marrow Bulb can be harvested fairly easily using a certain tactic. You build an exocraft pad and drive your exocraft through the cave systems destroying all but the marrow bulbs as you drive, this makes it super easy to harvest them. If you're looking for a good planet to farm them you can find one in the Rare Resource list linked below, it only requires 2 glyphs to dial so is very accessible. If you have all the glyphs you can find far greater amounts of Marrow Bulbs on my new home planet, both sides and behind the portal is a vast network of closed and open cave systems, you could quite easily gather a few hundred voltaic cells worth in a few hours. If you are not in Euclid, just find a planet with large open cave systems, it makes it far easier to harvest. And that is the gases sorted, we'll go over the schedule for farming everything at the end, but next is the Metals. There are only 3 of these needed, and the best and most consistent way to gather them is via the Autonomous Mining Units. We need far less of these than the gases and are a little cheaper to build. As this is so small and to conserve time while harvesting as well as the nature of Autonomous Mining Units, we will only harvest and recharge these once per Cycle, so you require 14 Autonomous Mining Units for each of the 3 resources. With a total of 42 Autonomous Mining Units required, the resources need to craft them are far less horrendous than the Atmosphere Harvesters. As with the Harvesters, there is a base I built specifically for this purpose, that base creates 14 Heat Capacitors and 22 Lubricant per harvest and will get you up and running in no time. Here are 2 addresses in Euclid that have the Gold, Emeril and Iridium in the required forms to use for Autonomous Mining Units. You may notice if you look hard that these 2 planets are on the Atmosphere Harvester lists, this is simply an efficiency move, and is set in the schedule to just have 2 fewer addresses to dial and visit. As before these are for Euclid, so if you are in a different galaxy, just look for planets which have Gold, Iridium and Emeril in the large tall block form or the concaved ground pit form, close to the gate. Autonomous Mining Units are limited to 5 per region, now I have confirmed that these are planetary regions such as the regions that limit Signal Scanners. If you've ever played around with Signal Scanners you'll know these regions are both static and quite small cubes of space, essentially the systems or planets coordinates. So, on these deposits, especially the rounded deposits, you can fit far more than 5, 20 is quite easy with a potential 40 on the cylindrical resource deposit structures. With this in mind, you should try to place them very close together, starting with corners if a cubed deposit, due to the likely hood of it crossing multiple regions, I suspect the cuboid deposits may spawn in accordance to the regions while the circular overlap a little more making them slightly more viable for multiple sets of units. Another thing I noticed during my testing is that sometimes the mining units in certain places will display and produce heridium even though it is on something else, if this happens, you should harvest the item and refuel then see if it changes to the correct material and not do what I did with the first lot and destroy several and replace elsewhere, this is an expensive mistake and the last resort. These Autonomous Mining Units will of course also need fueling like the Atmosphere Harvesters, this will be addressed next along with the fuel for the Harvesters. And on that note, let's cover the last few resources needed to craft your Stasis Devices. Ok, so all we have left to account for is 3313 Iron, 3313 Heridium, 7150 to 7425 Carbon and the 10,450 to 10,900 Plutonium needed to fuel the Atmosphere Harvesters, Autonomous Mining Units & the Ship getting from base to portal. The Heridium and Plutonium are super simple, you should visit some Oppulent and Affluent systems that sell large amounts of Plutonium and Heridium, and teleport home to build those up in the Teleport List in your base. You should be looking for Space Stations that sell 4000 or so Plutonium at any one time, 3000 is acceptable but if all are around 4k, you will only need to visit 3 of them instead of 4 saving you a little time. Use these to teleport between, to very easily gather that 3313 Heridium, and also quite easily gather the Plutonium required for fuel. The Heridium will likely be buyable in a single purchase, the Plutonium will require visiting all or most of them. Also be sure when refuelling the Units and Harvesters that you always fill them in a single click, don't use 39 then top it up, they will glitch that way and run out of energy before completing the stack putting you way behind schedule. The fact that they need 50, and Plutonium stacks in a multiple of 50, makes it super easy to just use even stacks to refuel. The Iron cannot be bought in sufficient quantities in most cases, so for this, there is ample time in the schedule to harvest it manually. For those that do not have access to remotely decent amounts of iron at or near their base, you can find below, an address in Euclid that has lots of iron right by the gate. Iron is not at all hard to come by, but occasionally there are planets with patches of hardly any. The Iron and Carbon harvesting will require charging of your multi-tool, this has been accounted for to a certain extent, 100 of the plutonium bought earlier is for this purpose so if you go over, you will require more, but this build has a trading terminal so this shouldn't be a problem. Along the same lines, if you require extra trips to the portal such as to go to a different planet for your iron, you will need an extra 100 Plutonium for the there and back trip. And there you have it, all the resources covered. All that's left is to look at the schedule breakdown of when to do what. An endeavour such as this is best approached like a military operation, as such a schedule is needed to run smoothly, you are, of course, free to do it how you wish but this schedule has been timed well and tested to give you time to perform each task and stay within the limits of the growing crops duration. 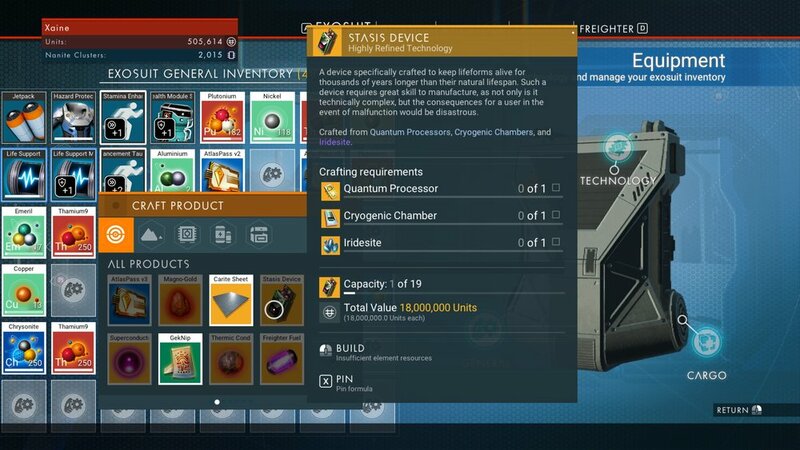 Inventory management is a huge part of this, you will want to have your hauler active, as large as possible, I use my 48 slot hauler which has the maximum of 43 slots free, you should have your exosuit and cargo slots maxed also at 48 slots in your exosuit and 25 slots in your exosuit cargo. If you are doing multiples of the schedule you will want to keep some space in your freighter also to send the completed Stasis Devices, freeing up space to continue another cycle. Crafting should take place in your ship unless you run out of room in which case craft in exosuit and transfer to the ship before continuing. This doesn't require you to be next to it and can use the resources from both your exosuit and ship in spite of the proximity. This will also save you time in transferring after. The schedule is split up into 15 minute sections to accommodate the harvesting, having said that, the game timer acts strangely, due to portal and teleport travel, the game does not continue the timer when in any kind of portal or teleportation loading and as such while the overall growth times are 2 hours, this schedule actually covers a timeframe of up to 3 hours dependant on the system you are playing on, this is due to the speed of your PC or PS4 dictating the length of the loading. That is why at the beginning I did not give an exact units per hour and instead a range, a mixture of the distance of your base from the portal, the level and upgrades on your multi-tool, your computer specs and whether you suffer from the double glyph bug will all have an effect on the length of time this cycle takes. It is also fully modular and built in such a way to accommodate an infinite amount of cycles in a row. As the haul of Stasis Devices is 26.5, the first cycle will net you 26 full devices and the second 27, because of this it is slightly different each time, and so any differences are noted in parenthesis, so anything in parenthesis is specifically for the second cycle in a row, 2nd, 4th, 6th, 8th, and so on, though once you hit the 8th you've made enough to max your units. Craft Heat Capacitors, store in the ship. Portal to the first 7 Gas Harvester Planets and harvest then refuel the harvesters. Craft Ammonium Salt & Thermic Condensate. Harvest Frostwort, Gamma Weed, Coprite and Star Bramble. Craft Heat Capacitors, Poly Fibre, Lubricant, then use Remaining Frost Crystal to Craft Glass in your exosuit cargo then Craft Circuit Boards and Living Glass in your ship. Portal to 9 more Gas Harvester Planets and harvest and refuel the harvesters. Craft Ammonium Salt & Enriched Carbon then 21(22) Hot Ice. Portal to Final 10 Gas Harvester Planets and harvest and refuel the Harvesters. Craft Ammonium Salt, Enriched Carbon, 5 Hot Ice, Thermic Condensate then craft 26(27) Cryo-Pumps, then Cryogenic Chambers. Craft Glass, Lubricant, Poly Fibre then Circuit Boards and Living Glass, then Cryogenic Chambers. Craft Glass, Living Glass, Cryogenic Chambers. Portal to the First 7 Gas Harvester Planets, Harvest and Refuel, on last planet harvest 1(3) of the Atmosphere Harvesters & Harvest 13(14) of each the Gold and Iridium Mining Units. Craft Ammonium Salt, Thermic Condensate, Magno-Gold, Aronium then Semiconductors. Craft Glass, Lubricant, Poly Fibre then Circuit Boards, Living Glass, then Cryogenic Chambers. Portal to 9 more Gas Harvester planets, Harvest & Refuel the harvesters, on the last planet harvest 1(3) of the atmosphere harvesters and harvest 13(14) of the Emeril Mining Units. Craft Ammonium Salt, Enriched Carbon, Superconductors, Grantine then Quantum Processors & Iredesite. Portal to final 10 Gas Harvester Planets and Harvest then Refuel, on last Planet harvest 1(3) of the Atmosphere Harvesters. Craft Ammonium Salt, Thermic Condensate, Semiconductors, Enriched Carbon, Superconductors, Quantum Processors then finally Stasis Devices. If continuing to another cycle, Transfer Stasis Devices to Freighter. I'm not going to lie, it's a tight schedule, but if you stick to it, it is quite achievable to hit the cap in a 2 fairly monstrous sessions. Below are the 2 downloads for the text files for the schedule and list of Portal addresses if you reside in Euclid. Though please do take breaks, it is likely better for your health to take a break between each cycle & good luck with your crazy unit making endeavour. It is perfectly acceptable to use my farm base if you are on PC, Normal and in Euclid as your source of the crops, it is only 1 minute 30 seconds from the portal so is ideal for this purpose, though as always, please do not claim a base on my planet or in my system as it will override my base being seen by other people, this goes for all player bases. If you have learned anything today consider checking out my youtube channel for video guides and subscribe if you haven't already for more, and maybe think about checking out my Patreon, a dollar a month is a great way to support the channel & website and get early access to the videos.